You can visit Vung Tau all the year. The dry season is from November to March, when the weather is cooler. In April it gets quite hot and the rainy season is from May until October. Walking is easy in Vung Tau, there is not much traffic and easy access to everywhere. 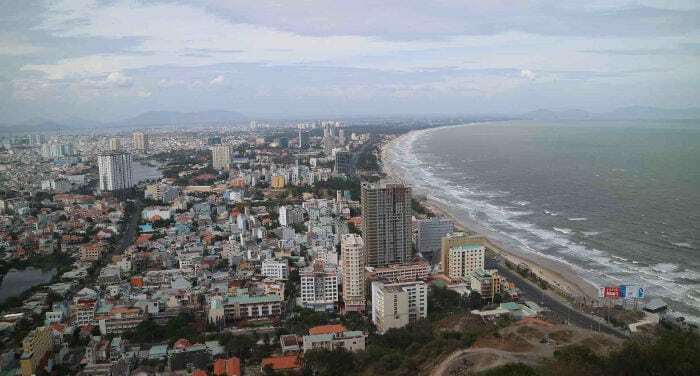 Vung Tau is a small place, there are taxis but they are more expensive than in Saigon and men on motorbikes will ask foreigners if they want to go somewhere, but they will not hassle you like in some other countries. When walking between the roads, there are many trees, flowers and small parks, it is very enjoyable to walk around there. There are two hills in the city, where you can walk or drive up. One of the hills has a lighthouse on top, where you will get a nice view of the city and beaches. At the top, there is a statue of Jesus similar to the one in Rio De Janeiro. The statue is surrounded by gardens and is place is peaceful, but you must remember to dress respectably if you want to go inside the statue. A t-shirt is fine, but you shall avoid shorts. I found out by experience and bought a t-shirt very close to the statue, in the souvenir shop, for 100,000 VND. Inside the statue there are steps going up inside the arms, where you will have a great view. You cannot take any bags inside the statue as it is a very narrow space going up the steps. Keep your valuables in your pocket and you can take a camera up. You can leave your bags outside the statue, the security man will stay near by. Also, in Vung Tau there are nice beaches, although at weekends it gets quite busy as many Saigonese come here. From the harbor you can see lots of fishing boats coming in in the early morning, and at night it is all lit up. There are plenty of shops in Vung Tau, as the city has Vietnam biggest off shore oilfields. You can go to the Vung Tau market for buying fruits, vegetables, and local handicrafts. For fashion and sportswear, you can go to the Imperial Plaza, while for household goods you can go to the newly opened Cooper Martin. Vung Tau offers a fairly quiet nightlife, however there are lots of small bars along the sea front, where you can play pool, chat with the girls, sit in cafes and restaurants. There are plenty of good restaurants, and lot of fresh seafood. However check the prices as some can be expensive. All restaurants have lots of fresh vegetables and there are many inexpensive vegetarian restaurants. Banhart Knot is a favorite among locals. There you will find crispy cakes made with shrimp and onion, Chao Hao (an oyster porridge), and Lau Ca Duoi Saw fish hot pot. If you want foreigner food, here you will find Indian, Mexican, pizza and burger restaurants.